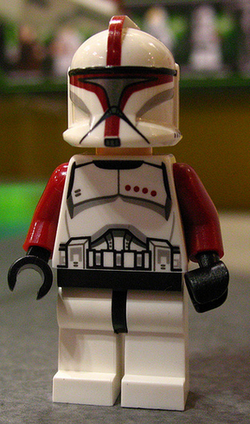 A Clone Trooper Captain is a minifigure released in 2013 for the Star Wars theme. The Clone Trooper Captain minifigure features white legs with a black leg joint, and a white torso with black hands and red arms. The red is used on the figure to denote the trooper's rank of captain. The torso's front printing includes black for outlining the various plates and parts of the armour, including a belt at the base of the piece. Also, on the left chest plate, four red dots in a horizontal line are present. This minifigure has a flesh-coloured headpiece that features printing for several facial features- black eyes with white irises, downturned black eyebrows, a mouth outlined with black and filled with white, depicting gritted teeth, and darker flesh printing for outlining and wrinkles. The trooper's helmet piece is white, with a predominant crest at the top, typical for Phase I clone trooper armour. Black and grey printing is used to represent the visor and other aspects of the helmet. A vertical red stripe also runs down the centre of this piece, from the base of the crest to the bottom of the helmet. Red is also present below the bottom of the whole visor section. Along with the helmet, the trooper comes with one accessory- a rifle with a Technic pin placed over the barrel. Clone trooper captains were clone troopers who were placed in command of companies of 144 troops. The rank of captain was one the two ranks indicated by red armour flashes painted on a clone trooper's armour during the start of the Clone Wars. Captains were ranked directly between lietenant and major, the latter of which also had red armour flashes. Facts about "Clone Trooper Captain"
This page was last edited on 9 January 2016, at 20:37.